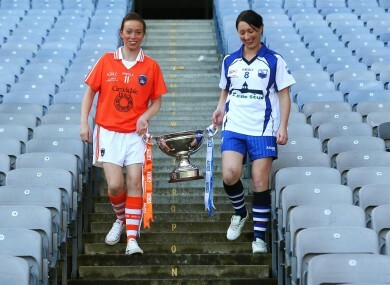 Waterford and Armagh will be seeking to graduate to senior level in Sunday’s TG4 All-Ireland Ladies Football final. Mags McAlinden of Armagh with Waterford's Michelle McGrath who contest the Intermediate final. SUNDAY’S TG4 LADIES Football Intermediate Championship final will be seen by both Waterford and Armagh as the chance to take the first step back towards the upper echelons of senior level. Waterford reached eight senior finals out of 10 between 1991 and 2000, winning five, but they now find themselves in the second tier as they try to rebuild. For manager Pat O’Brien, it has been a case of allowing the side to gain the requisite experience to ascend back to senior. “It’s a long time since we were senior,” he says, “but the one thing is that we’re a young team and a growing team. It has probably been good for the county, we are starting to mature now and hopefully we can kick on. In his first year in charge, O’Brien felt that his side were good enough to make a tilt at the All-Ireland. “We started back last September and I’m happy with the way things are going. We knew that we had a strong panel and our main objective starting out was to do well in the league. We did that and then we won the Munster championship for the fourth time in a row. The Ulster side have been senior more recently, re-grading last year. They reached the 2006 senior final, losing by a point to Cork, and their boss James Daly acknowledges the the work of his side in giving themselves a chance of an immediate return. “Some of the girls felt that we didn’t need to go down and they wanted to put that right. They have put a lot of work and a lot of effort in and we’re back where we want to be. We have eight girls from the 2006 panel, maybe three or four would have started that day. “We have two or three who were on the fringes then too, so hopefully that can help. It’s great for someone like me to be in charge of a team where you have so many leaders. This is the third meeting of the counties this year, and while Armagh have the upper hand so far, Daly is not taking anything for granted. Email “The Déise and the Orchard set for showdown”. Feedback on “The Déise and the Orchard set for showdown”.